A bright infographic of your favorite locales, these dish towels capture the feel and charm that make some of America's best-loved regions so special. 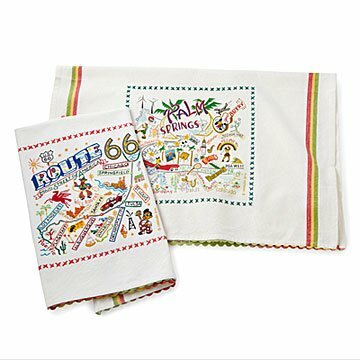 Featuring iconic names, images, and landmarks, these towels are the perfect reminder of a favorite trip, vacation spot, and even the place you call home. Three stripes down both sides and hand dyed ric-rac top and bottom add a charming touch. Images may vary slightly due to revisions. Each towel is silk screened and then framed with a hand embroidered border on a 100% cotton dish towel. Made in India. Click here to see all available Region Dish Towels. A fun gift for friends and family. I gave this item as a hostess gift and she loved it! It is extremely well made and very attractive. I would not hesitate to order it again! It is a very unusual gift and meaningful to the recipient. This was a perfect gift to remember a fabulous Trip to Napa Valley. Service was excellent. I gave a couple of these as gifts to people who are big wine lovers. I can't speak to the quality after use, but at first glance they do appear on the thin side and the design may fade with some washings. On the positive side, the colors are great and it makes a fun piece to add to a kitchen. Might be best used as more of a decorative piece than everyday towel. The design could be larger. I love the dishtowel I ordered of the North Pole. It's a perfect kitchen accent for Christmas. I only wish the design was larger!!! My husband and I actually cut around the border of this beautiful towel and had it FRAMED, it was so beautiful! Terrific little fabric "envelope" it came in, too! This was a unique and sentimental gift for my sister... she loved it! I received a RT 66 pillow as a gift. Last month I visited South Dakota and bought one of your Mt Rushmore towels. With the information with the towel I was able to order the Carmel towel. I bought this as a gift of thanks for hosting me at a friend's home in Carmel by the Sea, and as a useful reminder of our fun weekend together.